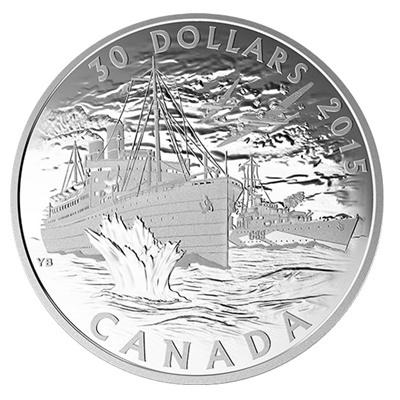 Commemorating the important historical significance of the merchant navy to the allied victory in World War II, the Royal Canadian Mint released the 2015 Canada’s Merchant Navy in the Battle of the Atlantic 2oz Fine Silver Coin. Canada’s merchant navy provided the invaluable services of transport across the Atlantic Ocean to deliver much-needed supplies during the Battle of the Atlantic from 1939 through 1945. Described as the longest continuous military campaign, the engagement saw many supply ships sunk by enemy U-boats and warships. More than 25,000 voyages were completed by the merchant navy, delivering an estimated 165 million tons of supplies. 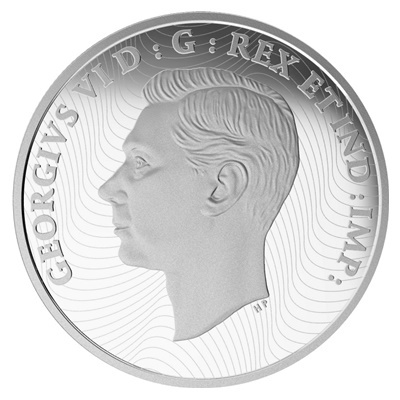 Canadian artist Yves Bérubé completed the design found on the coin’s reverse. It depicts the treacherous conditions of the Atlantic during World War II. In the image, the SS Duchess of York is seen taking fire from two enemy aircraft, which would eventually lead to its sinking and 34 casualties. In the background, the HMCS Iroquois is shown. It helped rescue 628 SS Duchess of York survivors. Inscribed above the design is 30 DOLLARS and 2015 with CANADA found below. Minted as legal tender of Canada, the historical effigy of King George VI is seen on the coin’s obverse. The portrait was originally designed by T H Paget. Each coin has a total weight of 62.67 grams and a diameter of 54 millimetres and struck to collector proof quality from two ounces of 99.99% pure silver. Mintage for the coin is limited to only 5,000. 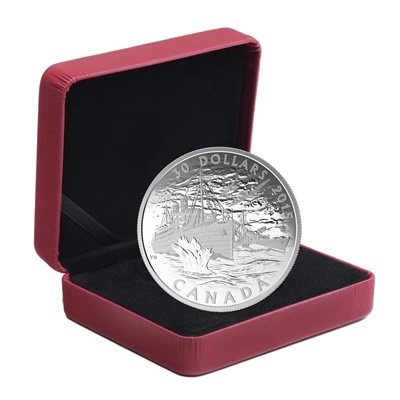 The coin is encapsulated and presented in the original Royal Canadian Mint maroon clamshell presentation box. 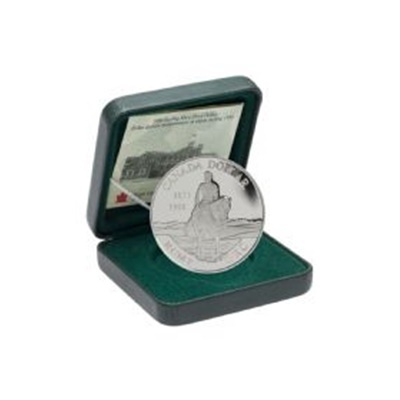 A beautiful collectible for commemorators, and a prestigious addition to any Canadian military- or history-themed collection.